A selection of stone species for your project is made. This can be done in our showroom or at a number of different stone wholesale slab yards in the Detroit Metropolitan area. Your cabinets, walls, and floor finish selections or colors are helpful in this process. Stone species and slabs are priced individually by the square foot and divided into groups for budgeting and selection convenience. A drawing with dimensions is provided by the customer or created by our sales consultants. The information required for this drawing can come from a blueprint, cabinet plan, the customer’s own measurements, or a trip to the customer’s home or project location for a field measurement. A project review with our sales consultants clarifying stone species, layout, edge profile options, and all accessories will give us the necessary information to provide a quote for the finished product. Upon acceptance of the quotation from Tile & Stone Works, a 50% deposit will be required prior to templating and slab procurement. Once we have a deposit commitment, the job will commence with slab procurement and fabrication. Final payment is due at the time we contact to schedule installation. 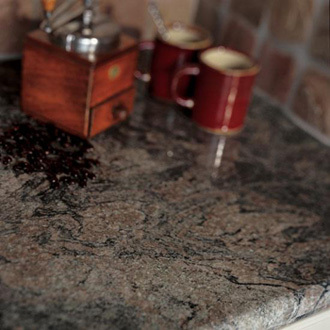 Tile & Stone Works will warranty our granite and solid surface work from defects in manufacturing and/or installation for a period of twenty (20) years from the original date of installation. Tile & Stone Works will repair or replace without charge the countertop if it fails due to any defect in manufacturing or installation. Tile & Stone Works’ warranty does not cover countertops installed outdoors. Also not covered are problems related to plumbing fixtures that have been removed or replaced since their original installation or countertop damage caused by physical or chemical abuse, improper maintenance, structural settlement, earthquakes, tornadoes, fires, floods or other acts of God. Claims related to the natural characteristics of the stone, including (without limitation) color and grain variations, water lines, surface marks, crystal pits, and fissures are not accepted. Shade variation, granular voids, fissures, and other naturally occurring irregularities are inherent in all natural stone products. Tile & Stone Works will refund any deposit for unperformed work or uncut slabs. Once a slab is cut or fabricated there will be no refunds. Handling and templating fees may apply to all canceled jobs if work on these items has commenced.